„Can I speak to Zarni?“ – A simple phrase people may use to disguise their request for assistance when facing harassment in 7th joint, one of Yangon’s most popular nightlife venues. This was the initial thought behind the Break The Silence – #AskForZarni initiative. The bar and security staff of 7th joint were the first to be trained on sexual harassment and assault at the beginning of July. The training combined harassment education with bystander intervention training. It was held by Dr. Thet Su Htwe, founder of Strong Flowers, a sexual health education organization, as one part of Break The Silence – #AskForZarni’s goal to build up an infrastructure within Yangon’s nightlife that enables and encourages accountability to respond and prevent harassment and assault. Additionally to the training, bars and nightlife venues agree to adopt a written policy against harassment and assault, and they put up posters, which encourage bystanders and people who are being harassed to ask staff for help. 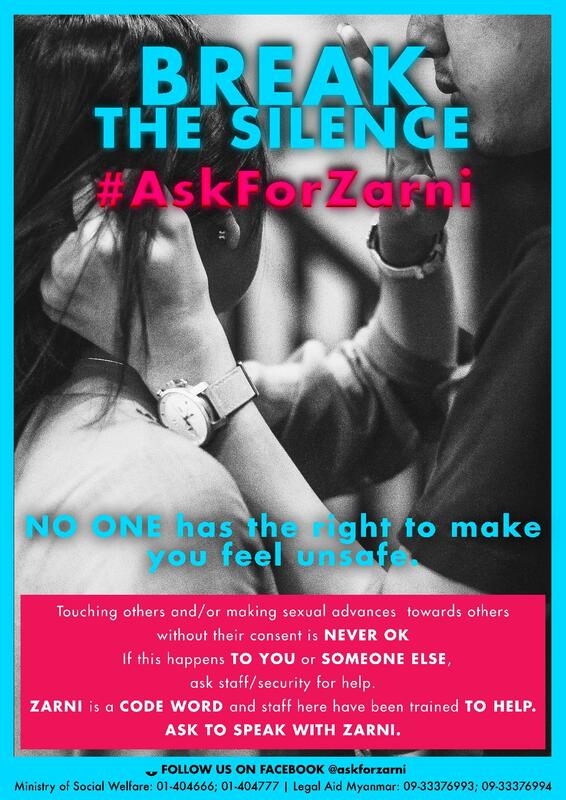 Such a poster can now be found at 7th joint, which functioned as a pilot bar for the initiative Break the Silence: #AskForZarni. It shows typical scenes of harassment in nightlife to explain sexual harassment to guests and how to use the code “Ask for Zarni”. In this way, everyone at the bar is aware and bystanders are encouraged to seek assistance through the posters. „We, local and non-local women and men living in Yangon and visiting your places on a regular basis, are addressing you to raise awareness of sexual assault which is becoming an increasing problem in Yangon nightlife. We write this letter to you in the hope that you listen to our requests. We seek your support and ask that you join us in our efforts to create a safe space for men and women who frequent nightlife establishments in Yangon. 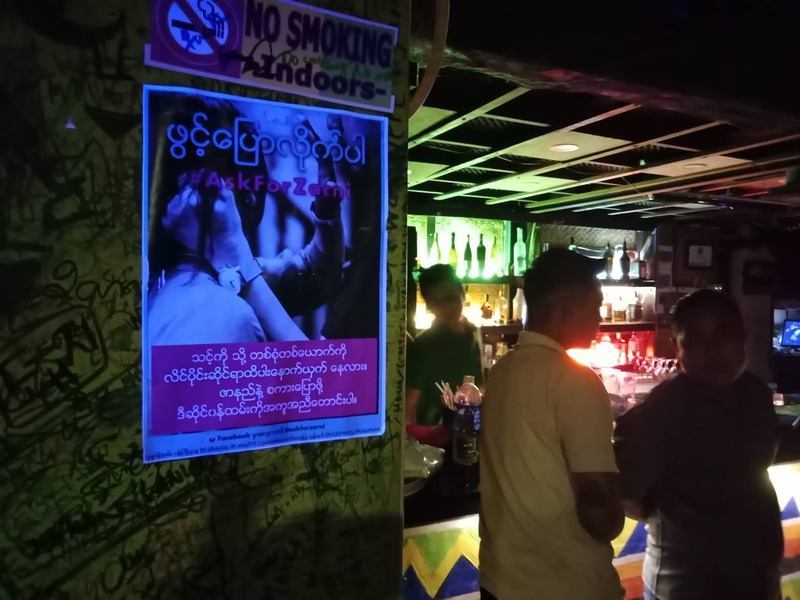 Our aim is for all people to enjoy going out in Yangon without fear of being harassed, harmed, and/or assaulted“ (Awareness raising of sexual assault in Yangon nightlife – Petition). Ask For Zarni is literally breaking the silence. It is a code to ask for help when one is facing a critical situation. The situations include, but are not limited to, forcing someone into unwanted conversation, into close physical proximity, inappropriate physical contact by grabbing, groping, and restraining, as well as making unwanted sexual comments and advances. Asking for Zarni instead of asking for help is a less direct and easier way to speak up, especially in Myanmar where many people are very non-confrontational and indirect in their communication style. When people may feel shy, insecure, vulnerable, or experience a sense of shame, they may feel more comfortable asking to speak to Zarni than directly saying they are being harassed. People have asked, “Why Zarni?“ or „Who is Zarni?” Zarni is a male and female name in Burmese, and Zarni means brave in Burmese language. Thus, all of us are Zarni when we speak up and break the silence. All of us are brave. The posters which the initiative designed are supposed to depict ‚typical harassment scenes,‘ ones that are common but often overlooked and not identified as harassment. The core group of the initiative used the Facebook group Yangonites against Sexual Harassment and Assault, asking people to volunteer for a photoshoot at 7th joint. The photo shoot started off with a brainstorming session on typical harassment situations in nightlife with the volunteer models. During the discussion, the models nodded in agreement, expressing that such situations are not unfamiliar to them. Then they re-enacted the discussed scenes in front of the camera. 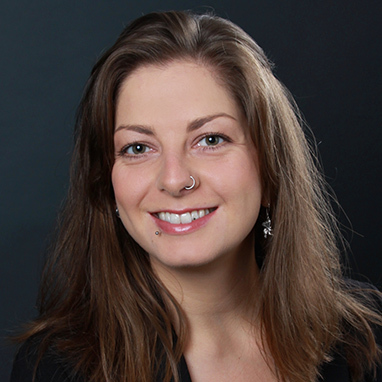 Carolin Hirsch is a PhD candidate in Social and Political Anthropology at the University of Konstanz. For her PhD project „Activist becoming in contemporary Myanmar“ she is conducting long-term fieldwork in Yangon. During her first fieldwork stay she co-founded the initiative „Break The Silence: #AskForZarni“. Carolin Hirsch ist Doktorandin in der Arbeitsgruppe Ethnologie und Politische Anthropologie an der Universität Konstanz. Ihr Promotionsprojekt trägt den Namen „Activist becomings in contemporary Myanmar“.